The throat (see the image below) is part of both the digestive and respiratory systems and is responsible for coordinating the functions of breathing and swallowing. From superior to inferior, the throat is subdivided into 3 sections: oropharynx, hypopharynx, and larynx. 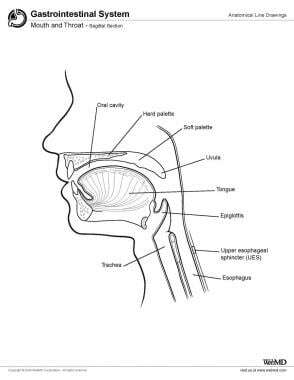 Together, the oropharynx, hypopharynx, and larynx function to sense and propel a food bolus from the mouth to the esophagus in a coordinated fashion while protecting the airway. Mouth and throat, sagittal section. The pharynx is bounded by the base of the skull superiorly; the cricoid cartilage inferiorly; and the nasal cavities, the oropharyngeal inlet, and the base of the tongue anteriorly. The boundaries of the oropharynx are the lower edge of the soft palate superiorly and the hyoid bone inferiorly. The anterior border is formed by the oropharyngeal inlet and the base of the tongue, and the posterior border is formed by the superior and middle pharyngeal constrictor muscles and their overlying mucosa. The oropharynx communicates with the oral cavity via the oropharyngeal inlet, through which it receives a food bolus. The oropharyngeal inlet is made of the lateral palatoglossal folds, just anterior to the palatine tonsils. The folds are themselves made of the palatoglossus muscle, which originates on the palate itself and its overlying mucosa. Inferiorly, the posterior one third of the tongue, or the base of the tongue, continues the anterior border of the oropharynx. The vallecula, which is the space between the base of the tongue and the epiglottis, forms the inferior border of the oropharynx. This is typically at the level of the hyoid bone. Within the lateral walls of the oropharynx are the paired palatine tonsils, sitting in a fossa separated anteriorly by the palatoglossal folds and posteriorly by the palatopharyngeal folds. The tonsils are masses of lymphoid tissue that are involved in the local immune response to oral pathogens. The muscles that form the posterior wall of the oropharynx are the overlapping superior and middle pharyngeal constrictors and their overlying mucous membrane. The glossopharyngeal nerve and the stylopharyngeus muscle enter the pharynx at the border between the superior and middle constrictors. The borders of the hypopharynx are the hyoid bone superiorly and the upper esophageal sphincter (UES), or cricopharyngeus muscle, inferiorly. The anterior boundary of the hypopharynx consists largely of the laryngeal inlet, which includes the epiglottis and the paired aryepiglottic folds and arytenoid cartilages. The posterior surface of the arytenoid cartilages and the posterior plate of the cricoid cartilage complete the anteroinferior border of the hypopharynx. Lateral to the arytenoid cartilages, the hypopharynx consists of the paired piriform sinuses, which are bounded laterally by the thyroid cartilage. The posterior pharyngeal wall consists of the middle and inferior constrictors and their overlying mucous membranes. Below this, at the level of the cricoid cartilage, the circumferential cricopharyngeus muscle forms the UES. This muscle tonically contracts during rest and relaxes during swallowing in order to allow a food bolus to pass into the esophagus. The larynx extends from the epiglottis to the cricoid cartilage and includes the vocal folds, which can rapidly adduct when the laryngeal mucosa is stimulated to prevent aspiration of food and other contents into the trachea. In addition to its role in airway protection, the larynx contains a number of cartilages and muscles that serve in voice production. It can be vertically subdivided into a supraglottis (from the epiglottis to the vocal folds), glottis (at the level of the vocal folds), and subglottis (from the vocal folds to the level of the cricoid cartilage). The muscular layer of the pharynx consists of an inner longitudinal layer and an outer circular layer (see the images below). The inner layer includes the paired stylopharyngeus, salpingopharyngeus, and palatopharyngeus muscles. The outer layer includes the overlapping superior, middle, and inferior constrictor muscles. Muscles of the pharynx, partially opened posterior view. The stylopharyngeus originates on the styloid process and inserts into the posterior border of the thyroid cartilage. It is the only muscle of the pharynx innervated by the glossopharyngeal nerve. The salpingopharyngeus originates on the cartilage posterior to the opening of the eustachian tube and inserts into fibers of the palatopharyngeus muscle. 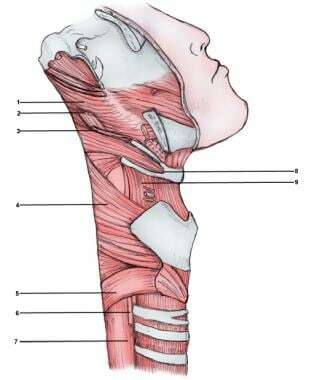 The palatopharyngeus muscle forms the posterior pillar of the palatine tonsil, originating from the posterior border of the hard palate and inserting on the posterior border of the thyroid cartilage, along with the stylopharyngeus. It functions in raising the throat and closing the oropharyngeal aperture. The pharyngeal constrictors function in a coordinated manner during swallowing to propel a food bolus through the throat and into the esophagus. Each of the pharyngeal constrictors circumscribes the posterior wall of the pharynx and inserts on the median raphe, which is a midline continuation of the buccopharyngeal fascia (see Microscopic Anatomy). The superior pharyngeal constrictor originates on the medial pterygoid plate, mandible, and base of tongue. The middle pharyngeal constrictor originates on the hyoid bone and stylohyoid ligament. The inferior constrictor originates on the oblique line of the thyroid cartilage. At the superior end of the superior constrictor lies Passavant’s ridge, which is a visible constriction during elevation of the pharynx while swallowing. It is created by the interdigitation of palatopharyngeal fibers with the superior pharyngeal constrictor. The arterial supply to the pharynx comes from 4 branches of the external carotid artery. The primary contribution is from the ascending pharyngeal artery, which comes off the external carotid just superior to the carotid bifurcation and passes posterior to the carotid sheath, giving off branches to the pharynx and tonsils. The palatine branch of the artery enters the pharynx just superior to the superior pharyngeal constrictor. The facial artery also gives off ascending palatine and tonsillar branches, which help supply the superior pharyngeal constrictor and palate. The maxillary artery gives off the greater palatine artery and a pterygoid branch, and the dorsal lingual artery coming off the lingual artery adds a minor contribution. Blood drains from the pharynx via an internal submucosal plexus and an external pharyngeal plexus contained in the outermost buccopharyngeal fascia. The plexus drains into the internal jugular vein and, occasionally, the anterior facial vein. Extensive communication exists between the veins that drain the throat and those that drain the tongue, esophagus, and larynx. The pharynx drains into the deep cervical nodes along the carotid sheath. The hypopharynx may also drain into the paratracheal nodes. The lymphatic vessels of the larynx drain into the deep cervical nodes, pretracheal nodes, and prelaryngeal nodes. The pharyngeal plexus of nerves provides the efferent and afferent nerve supply of the pharynx and is formed by branches of the glossopharyngeal nerve (cranial nerve IX), the vagus nerve (cranial nerve X), and sympathetic fibers from the cervical chain. Other than the stylopharyngeus, which is innervated by the glossopharyngeal nerve, all of the muscles of the pharynx are innervated by the vagus nerve. All of the intrinsic muscles of the larynx are innervated by the recurrent laryngeal nerve, a branch of the vagus nerve, except for the cricothyroid muscle, which receives its innervation from the external branch of the superior laryngeal nerve, also a branch of the vagus nerve. The pharyngeal plexus receives branches of the glossopharyngeal and vagus nerves to supply sensory innervation to the pharynx as well. The posterior one third of the tongue, in the oropharynx, receives both its taste and somatic sensation from the glossopharyngeal nerve. The cricopharyngeus (UES) receives its parasympathetic input for relaxation from the vagus nerve and its sympathetic input for contraction from postganglionic fibers from the superior cervical ganglion. The mucous membranes of the oropharynx and hypopharynx consist of nonkeratinizing stratified squamous epithelium. 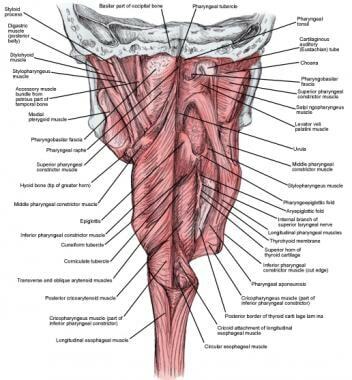 Deep to this is an elastic lamina propria; this layer separates the mucous membrane from the fibrous pharyngobasilar fascia, which is thickest superiorly at the level of its attachment with the skull base and thins as it descends to cover the constrictor muscles. The muscles of the pharynx include an inner longitudinal layer and an outer circular layer (see Gross Anatomy). The outermost buccopharyngeal fascia is a thin, fibrous layer containing the pharyngeal plexus of nerves and veins. Its attachments are the prevertebral fascia posteriorly and the styloid process and carotid sheath laterally. A diverticulum in the pharynx is an outpouching of tissue caused by herniation of mucosa or submucosa and muscle through the pharyngeal wall. The most likely location for a diverticulum to develop is an area just along the posterior pharyngeal wall just inferior to the inferior pharyngeal constrictor and just superior to the cricopharyngeus muscle. Ferreira LE, Simmons DT, Baron TH. Zenker's diverticula: pathophysiology, clinical presentation, and flexible endoscopic management. Dis Esophagus. 2008. 21(1):1-8. [Medline]. Beasley P. Anatomy of the pharynx and esophagus. Kerr AG. Scott-Brown’s Otolaryngology: Basic Sciences. 6th ed. Reed Elsevier; 1997. Chapter 10. Belafsky PC. Manual control of the upper esophageal sphincter. Laryngoscope. April, 2010. 120:S1-S16. [Medline]. Hacein-Bey L, Daniels DL, Ulmer JL, Mark LP, Smith MM, Strottmann JM, et al. The ascending pharyngeal artery: branches, anastomoses, and clinical significance. AJNR Am J Neuroradiol. 2002 Aug. 23(7):1246-56. [Medline]. Tsumori N, Abe S, Agematsu H, Hashimoto M, Ide Y. Morphologic characteristics of the superior pharyngeal constrictor muscle in relation to the function during swallowing. Dysphagia. April 2007. 22(2):122-9. [Medline]. Fast Five Quiz: Do You Know How Best to Approach Otitis Media?